Topsham poll worker Anette Philippon collects ballots the old fashioned way in Tuesday's special Maine Senate District 19 election. Town Clerk Ruth Lyons said she was not running out of ballots as was reported by a local newspaper via Twitter. 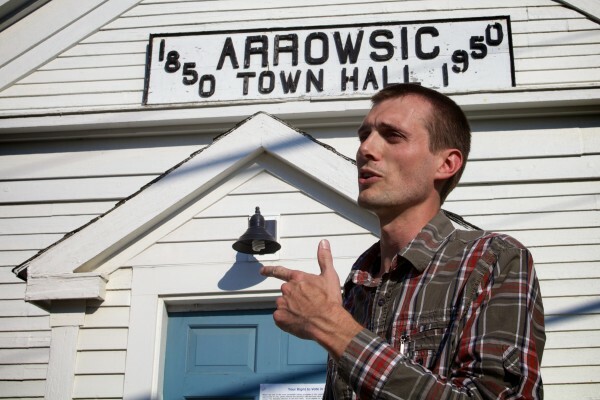 Voter Stephan Puff, a lay minister at his church, said voting is important before he cast his ballot in Tuesday's special Maine Senate District 19 election in Arrowsic. "I tell them to be the change they want in the world," he said of his parishioners. 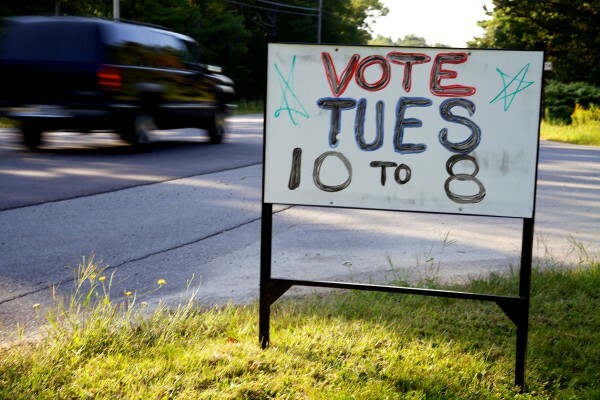 A sign in Arrowsic urges voters to exercise their franchise in Tuesday's special Maine Senate District 19 election. 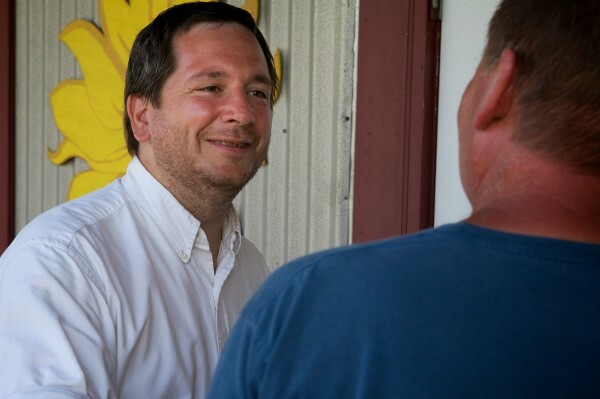 Green Independent candidate Daniel Stromgren of Topsham greets voters at his hometown polls Tuesday for the special Maine Senate District 19 election. Republican Paula Benoit of Phippsburg greets voters at the Topsham polls Tuesday for the special Maine Senate District 19 election. UPDATE: Democrat Eloise Vitelli won, according to an unofficial tabulation by the Bangor Daily News. TOPSHAM, Maine — Voters went to the polls Tuesday in “very high” numbers to cast ballots in the special election to replace former Sen. Seth Goodall, D-Richmond. The Maine Senate District 19 race, which has garnered statewide interest as a preview to 2014 elections and more than $155,000 in outside spending, pits Democrat Eloise Vitelli against Republican Paula Benoit and Green Independent Daniel Stromgren. Topsham Town Clerk Ruth Lyons said at 5:30 p.m. that turnout was “huge.” However, despite reports by other media, Topsham did not run out of ballots, Lyons said. Clerks all over the district, which includes all of Sagadahoc County and the Lincoln County town of Dresden, said they had seen high numbers of voters. 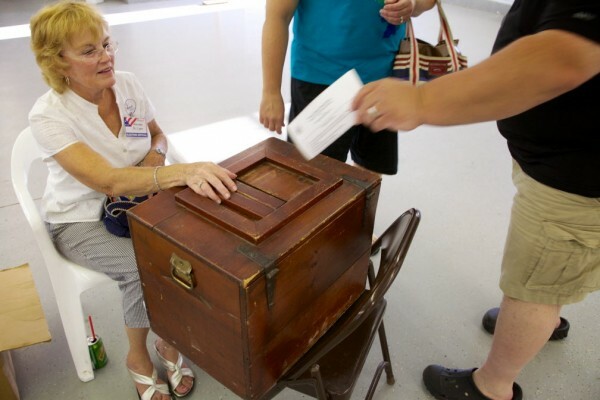 Bath City Clerk Mary White said early voting was heavy, and Arrowsic, a town with 412 registered voters, handed out about 160 ballots by 5 p.m. Bowdoin Town Clerk Melanie Page said 394 of the town’s 2,500 registered voters had cast ballots by 5:30 p.m.
“That’s very high for an election like this,” she said. In this special election, clerks and poll workers will count the ballots by hand, which could slow the reporting of results, some election officials said. Goodall resigned in July to head the Northeast region of the U.S. Small Business Association. He narrowly defeated Benoit, a one-term incumbent, in November 2008 to win the District 19 seat before defending it against Republicans David Kaler in 2010 and Jeffrey Pierce in 2012. He served as Senate majority leader during the recently concluded legislative session. The polls in Senate District 19 close at 8 p.m. Tuesday. Watch www.bangordailynews.com for full election results.